Summer Facials in Manhattan New York. Get rid of summer grime, sweat and get back your glowing healthy skin at Dyanna Spa in Manhattan, NYC! As we enter the peak of the summer, there’s one thing that’s surely not slowing down any time soon…the sweltering heat and humidity that surrounds us day in and day out. As lovely as the ease of breezy weather can be at times, we may not realize the damages its doing to our skin. Humidity causes our sweat glands to produce more oil than normal and because the layer of humidity prevents the sweat from evaporating into the air, it clings to skin creating a thick build up of oil which clogs pores and causes breakouts. What’s worse is that sometimes our daily cleansers aren’t powerful enough to truly remove all the grease. Yuck! At Dyanna Spa we offer a variety of facials specifically designed to reinvigorate and completely clear skin from whatever looms beneath the surface. With half of summer remaining, its time to regain your radiance and let your skin do the talking this season. 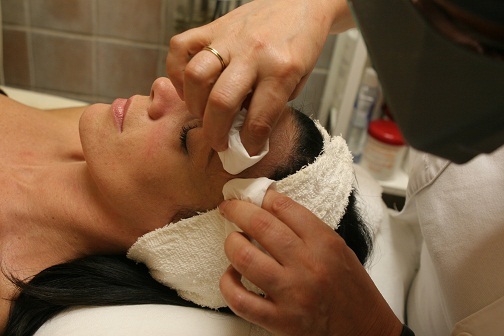 Deep Pore Cleansing Facial ($85 / 60 Minutes): The Deep Pore Cleansing Facial is perfect for the hot sticky weather and is a great option for all skin types. This facial is a thorough deep-pore cleansing facial that focuses on the extraction of white heads and black heads as well as other acne and impurities in the skin. The aesthetician first cleanses and purifies the skin prior to deep pore extrapolation, and then applies a soothing mask to moisturize and revive the skin, resulting in smooth grime-free glowing skin. Peeling Facial ($65 / 60 Minutes) : For a truly rejuvenating experience, the Peeling Facial at Dyanna Spa is the perfect choice. This professional deep exfoliation uses vegetable and fruit enzymes to free your face of tired, dull surface skin cells leaving behind a fresh layer of skin that can take years off your overall look. Perfect for achieving effortless healthy skin. Acne Prone/Problem Skin Facial ($85 / 60 Minutes) : This deep pore cleansing procedure is a perfect facial for those who are prone to acne and problematic seasonal skin. The facial incorporates Active Propolis and Blemish Control Mask as well as a Mud Mask to resolve your skin’s problems. Extractions of oils and dirt inside of pores are performed when/where necessary and a healing module is utilized to assist the closure of any open or infected areas on the face. For best results, a series of visits is recommended. Speak with your aesthetician to find out if this treatment is right for you or for more details. ADD COLLAGEN EYE TREATMENT AND/OR NECK FIRMING TREATMENT TO ANY FACIAL FOR $15 EACH! Collagen Eye Treatment: The Collagen Eye Treatment is a great way to reduce the fine wrinkles and bags that form around the eyes as a result of aging, stress, and weather conditions such as humidity. This quick procedure adds firming collagen to the skin which can instantly reduce signs of aging and puffiness around the eyes. Neck Firming Treatment: The Neck Firming Treatment at Dyanna Spa is a perfect added touch of relaxation to any facial. This treatment firms, lifts, and moisturizes the neck leaving you looking and feeling more rejuvenated with each treatment. There is a reason Dyanna Spa was voted the “Best Brazilian Waxing” spa in New York City by Citysearch. Our experienced technicians use a special wax formula to remove unwanted hair that is safe, effective, and practically pain-free. We can discreetly remove all of the hair around the genital area or leave a narrow strip. When you make your appointment, our experts will answer any questions you have about the Brazilian wax method. Dyanna Spa offers Brazilian wax treatments for both men and women. Next, you’ll want to get a manicure and a pedicure using our OPI No-Chip gel from our nail salon. With this manicure, you won’t have to worry about chipping, scratching, or dullness. What’s more, an OPI No-Chip manicure lasts up to two weeks. Our manicurists, who were also voted the best in Citysearch, will buff your nails, push back your cuticles, and apply the gel. OPI No-Chip gel is wonderfully quick drying so you won’t have to worry about smudged nails. You will simply love the variety of colors, and the special pampering you receive at Dyanna’s Spa. Start your summer vacation by giving us a call at (212) 995-2355 to make an appointment. Then you’ll be ready for your date with the good old summertime. Manhattan’s Dyanna Spa Nail Salon recently announced that OPI launched seven new shades of their Shatter nail lacquer, proving that nail art is still alive and well. OPI first came out with their Shatter nail polish about ten years ago. It is now so trendy that both Katy Perry and Serena Williams have teamed up with OPI to brand the collection. Shatter nail polish creates a marbled, cracked design when applied over a contrasting base coat color. The Shatter coat manicure actually separates when dried, resulting in a classy and cool look. It’s important that the two-texture finish be applied carefully. The first OPI color must be completely dry before applying the Shatter polish. After the Shatter polish is applied, you can see the effect take place immediately. It’s very, very cool. An OPI top coat is great for a high-gloss finish once both coats are completely dry. It will also help prevent chipping, seal in the color, and prolong the beauty of the manicure. The top coat is recommended by the professionals at Dyanna Spa Nail Salon. Some of the new colors — Turquoise, Navy, and Blue Shatter — reflect the shades of summertime on the beach. The other hues, White, Silver, Red, and Black Shatter, are classic colors but unique in their crackled appearance. Dyanna Spa Nail Salon has a large variety of OPI Shatter nail lacquer shades to suit any occasion. So book your appointment and call (212) 995-2355. Four Steps to a Flawless Look for 4th of July: New York Spa Makes Prep for Independence Day a Breeze! Women of Manhattan! It’s time for you to make room in your busy summer schedules, and set aside a Day to indulge at Dyanna Spa in preparation for the 4th of July. With this patriotic holiday weekend right around the corner there are necessary ‘mid-summer tune up’ steps every women should take in order to shine this 4th of July. After all, America is the land of freedom and opportunity so don’t miss out on Dyanna Spa’s great treatments that will be sure to add some spark to your summer. Don’t let unwanted cellulite stop you from showing off your bikini body! At Dyanna Spa we have perfected our anti-cellulite treatment by smoothing out fat tissue in just one hour. After this treatment you not only notice smooth skin, but you’ll notice an immediate weight and inch loss of 1-3 pounds. Tired of continually having to worry about hair removal? Electrolysis is the one true and tired method of permanent hair removal that is FDA approved! During the electrolysis treatment process hair is removed directly from the follicle to ensure a permanent removal. This process allows anyone to be eligible for electrolysis versus other treatments that are made for specific skin and hair types. Another great benefit of electrolysis that other treatments can’t boast about is that you choose the amount of time you wish the treatment to last for. In a hurry? Get smooth skin that will last you all summer in a quick 5 minutes. 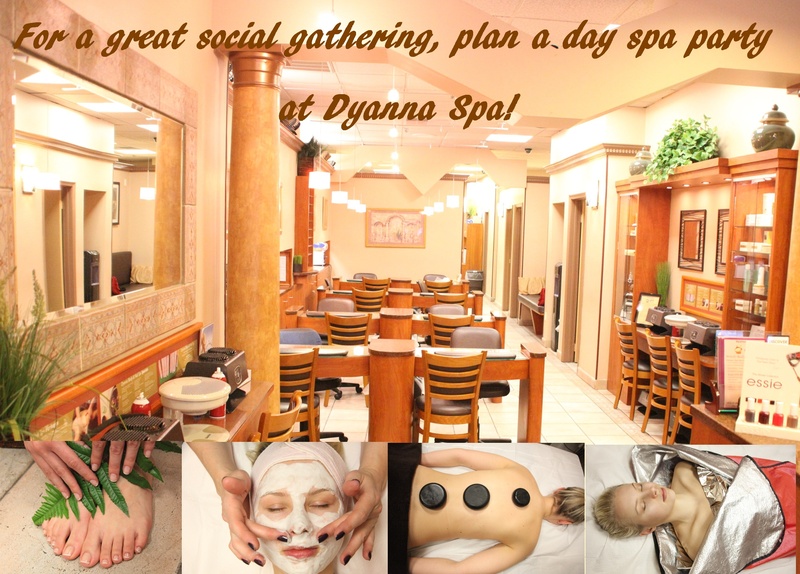 Have all day to spend at Dyanna Spa? Try our 60 minute treatment for silky skin all over! 4th of July is all about color! Whether it be Red, White, or Blue proudly displayed, or the vivid displays of fireworks-color is everywhere. So why not brighten your holiday weekend a little more with our Spa Manicure with a 10 Minute Reflexology Treatment. Relax as your tired hands receive the ultimate pre-manicure treatment as tension throughout the body will be relieved through the targeting of pressure points located in your hands. Then, choose from a large selection of colors and hues from only top quality nail lacquer’s such as OPI No Chip Polish, and Essie, and watch as your nails pop to life. We’ve picked out a few of our personal favorites in order to show our true colors this 4th of July. Go above and beyond your regular pedicure treatment and treat yourself to something you deserve. The summer heat can put a lot of strain in our feet, and flip-flops often don’t provide enough support leaving out feet aching and sore. Our Jelly-Pedi treatment is our most unique yet as it aims to relieve stressed out feet while exfoliating and hydrating dry and cracked skin. Your feet will leave cooled off and ready to tackle whatever your 4th of July may bring.